I don't have time today for a proper sepia saturday post, so I thought I'd just post one of my favorite photos from the family treasure box. 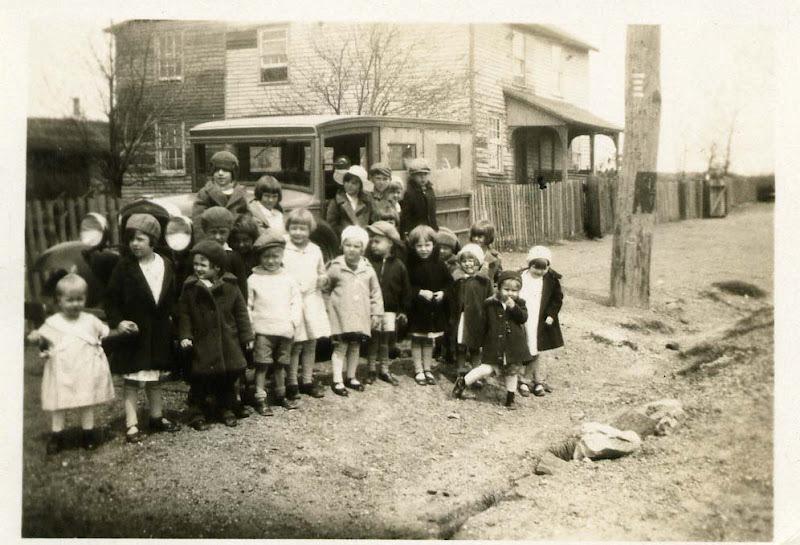 the photo includes a lot of children too young for school, so perhaps it is just a group portrait of some of the children living in harwood mines, pennsylvania at the time. one of the kids in the photo is rita, my mom (front row, 5th child from the left - girl with pageboy haircut). she was probably around four or five which means the photo was taken in 1929 or 1930.
during the 1920s and 1930s the little rascals (also known as our gang) was a popular film series. the series featured a group of poor neighborhood kids and all of the adventures they had together. missing from the harwood snap above is the presence pete the pup, or some might mistake the picture as the cast of the little rascals. go here for more sepia saturday posts. The Old Bands Are The Best! Heh, heh! They used to show the Little Rascals/Our Gang shorts in Baltimore as part of the after school TV programming back in the '50s and '60s. The photo's not only missing Pete the Pup, it's missing Farina and Buckwheat, too. This is a great picture. A whole bunch of young lives, gathered together and not thinking about tomorrow. That's a great photo! & gotta love any Little Rascals reference. That's a wonderful photo and I really enjoyed the Little Rascals film. I remember it from the 50's also. I must have been watching the same T.V. show as Roy. Your Mom was a real cute kid! this is so so sweet. love all their little hats and coats. I used to watch the Little Rascals every night on TV after school. It is a wonderful picture, but I do wonder what they were all doing together. I love their little shiny shoes and the small tailored coats. When I see a photo such as this one, I always wonder what happened to those children with their fresh morning faces. Great photo, and those were the days. What a charming photo. I particularly like the girl in front, who has her leg off to one side. The photo speaks volumes. Sharing that is such a reward to us. I think it is such a classic shot. You're going to be the poster-child for SS again with this shot! How delightful! It looks like a "proper" sepia saturday post to me. There is enough content in the photograph to keep you looking for ages. Seriously, it's a great shot. And a great post.